Food wrote: Not that I'll ever auction anything, but I have a question. Let's say I want to start an auction but have < 5 tg, what happens? It requires 5tg to start an auction, so I'm pretty sure you just won't be able to auction anything. You will have to sell some items or donate first. - After an auction is finished, a new transaction is created. - Added imgur plugin for direct image hosting. Some new features are coming soon, such as notifications, real-time update of current auctions and maybe some other goodies. Recommendation to auctioneers: don't start with your expected end price, that's not how it works... You will be more likely to sell an item if you start with a low starting bid. More bids will make the auction more interesting for others and it will draw more attention. Hello all one more time. Support for notifications has been added! You can choose whether you receive a notification and/or email for events related to auctions. Previous bid was 350tg with a few minutes left, then this happened. New rule update following this maybe? there is no need for a rule that forbids manipulating the result of an auction. user has been taken care of and auction is removed. Edit: Oh, so he got banned, serves him right. This means, you get to make full use of the trade center without having to refresh the page - it's all up to date. if this is not happening, smash the ctrl + F5 buttons! I have a couple suggestions for the auction system. Please let me know if I'm overstepping my boundaries. If we could possibly remove the 5 TG entry fee, and force the bidding to start at 10 TG. Where does the 5 TG go to? This would stimulate action in the auction house. IMO the action seems a bit stagnant for 2 reasons. People don't want to risk losing 5 TG for nothing, and I have seen more often than not, ridiculous starting bids. It seems that most of the auctions are set at the values that they hope to recieve, instead of have the starting bid be. Right now I see 3 active auctions. 2 of them are legit buys, as they are the bowzon set starting at 6 TG and "everything" starting at 5 TG. The 3rd is Mercenary Bomb for 100 TG. 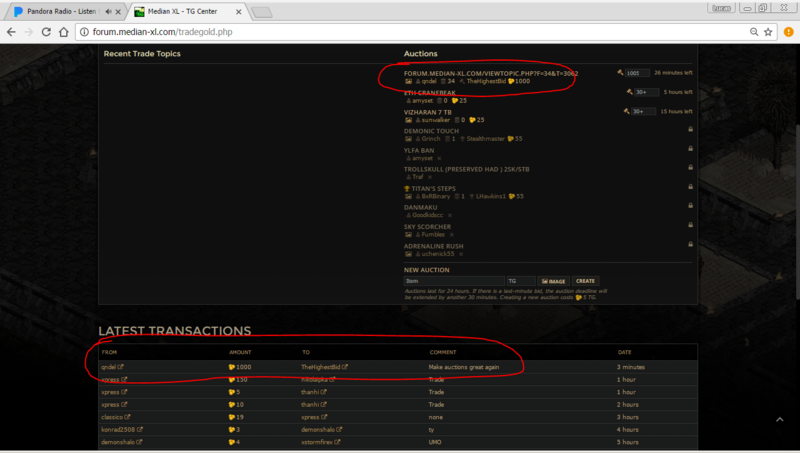 The latter of which the guy borrowed 5 TG to place the item up for bid. I think we can all agree that was an instant waste of TG. Another reason I feel like there isn't as much action on the auction block is because people feel reserved to only post high-value items. I love the auction idea, and it definitely adds some positive adversity to trading. I believe if there were no initial fee to post an item, we would see alot more items up for auction, which is a good thing. Sometimes people find value on otherwise lesser-valued items. If every item starts at 5-10 TG, alot more people would be bidding on items. If people don't like the idea of the low starting bid then the answer is simple. You don't have to auction your items. The previous statement is further highlighted by a member jacking the price up on his auction because he didn't want to risk having his auction finish at a lesser price than he desired. Just some food for thought. Comments? Concerns? Criticisms? Fire away!